Today I want to show you my favorite porcelain Doll. I bought her about 12 yrs ago at Cracker Barrel. I just fell in love with her sweet beauty and size. She is a very nice size little lady. I also like her 1920's dress. I have had her in my Bed Room ever since I got her. When my Connorman who is now 12, first noticed her he wanted to hold her, but of course I wasn't having none of that. He would reach for her and cry, and say mine, mine..finally when he was old enough to talk. I asked him one day why he wanted her so bad. "he said, my angel, keep me safe" Aww, bless his heart, I promised him when I died she would be his and he still says he wants his Guardian Angel when he's grown. He said that when he was little and went to sleep in there he wasn't scared as long as he could see her. He felt like she was watching over him. She is a beauty...Not what I'd think of as a guardian Angel but if he does, who am I to say no. Even her high heels are perfectly made to match her beaded purse, earrings and beads. Her feather hat and fake fur coat just set the whole outfit off. What a beautiful little doll, Molly, and such a sweet story about Connor. I enjoyed the slide show of your finches, too. I need to put some seed out and see if we can get some before they leave. She is a gorgeous doll! That is a sweet story. That is a sweet story Molly. The doll is a beauty! Love the details that went into the clothes. Just beautiful! 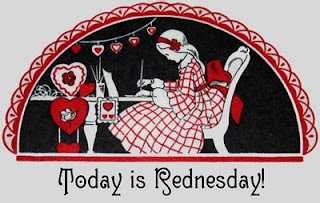 This is my first time to participate in REDnesday and I'm enjoying visiting the other participants. I love porcelain dolls and this lady in red really is beautiful. I can see why she is so special. I LOVE her shoes and her earrings!! The story of Conner is so precious-usually boys don't notice things like this. Have a great day Molly! What a sweet boy!! I hope we never outgrow our ability to see angels all around. She certainly is a beauty, right down to those awesome shoes! Such a sweet story, and I like that you didn't discourage him from liking her. I like your squirrel header and the finches. I really enjoy watching them change color in the spring. Little spots of sunshine! What a precious story about Connor. Lovely doll too. This doll is just beautiful. The details like the handbag, earrings and necklace are awesome. The dress is lovely, too. The story of your son touched my heart. I was given a bear for mothers day from my sons and husband. The bear sang the song "You know how much I love you" in very sweet voice. My two youngest sons always wanted to hold it hear her sing. They say the reminded them of me and made the feel good. Oh, what a vamp! She's beautiful! I especially like her shoes. What a well-dressed woman! I love your Lady In Red - reminds me of a Lorrie Morgan song - Lady In Red. That is a beautiful doll! the details are amazing. Connor is so sweet!!!! And I think he picked a perfectly beautiful guardian angel! She is really pretty and her clothes are just perfect! What a great story and a gorgeous doll!